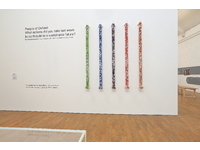 In 'Physical Bar Charts', viewers are presented with tall see-through tubes containing button badges of five colours, each colour with a specific message on. Visitors are prompted to help themselves to badges in response to a question. As they do so, the levels in the tubes drop, presenting an inverse bar chart showing the popularity of the badges. 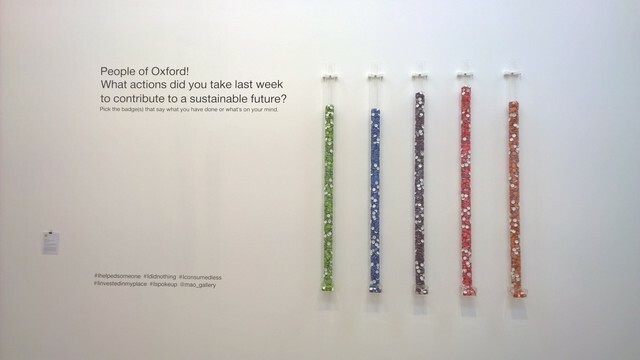 Installed over some weeks in a public space or gallery, the Physical Bar Charts are an example of social data gathering, inventive research, real-time reporting, and experiential inquiry. 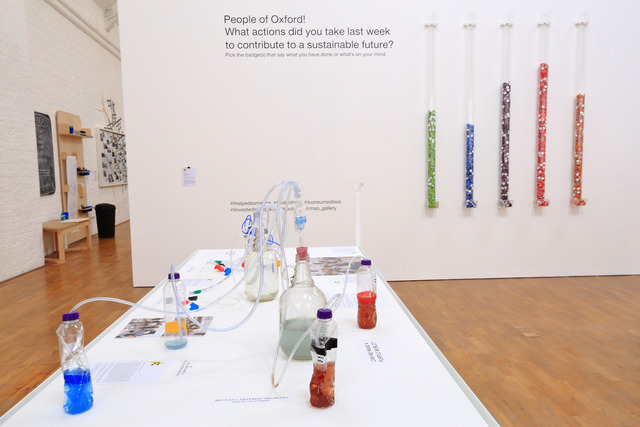 At the version of 'Physical Bar Charts' in the exhibition 'Future Knowledge' at Modern Art Oxford in 2017, visitors were invited to respond to the question 'What actions did you do last week to contribute to a sustainable future?' The badges they could pick suggested diverse responses to this question. They read: "I helped someone; I did nothing; I consumed less; I invested in my place; I spoke up." The 'Physical Bar Charts' offer a strikingly simple way of gathering and visualising data. And yet the statements on the badges, which refer to events in the past, once selected and worn on jackets make public commitments about everyday practices which are far from simple. 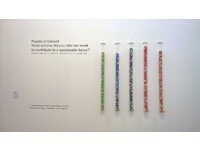 The Physical Bar Charts materialise participation not just in data-gathering but also everyday life. 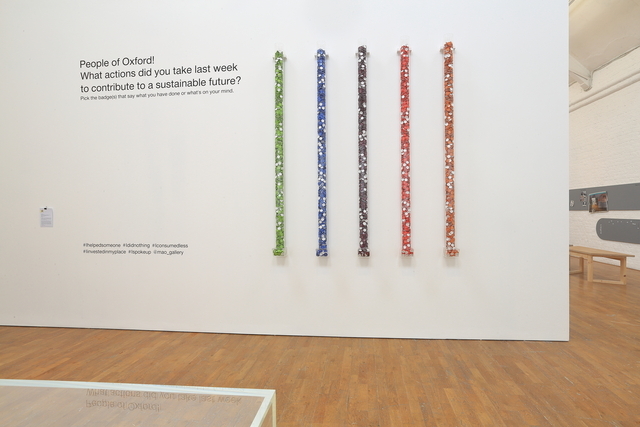 'Physical Bar Charts' has been shown over 10 times in UK and international galleries. 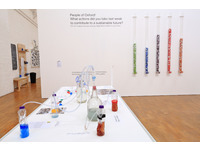 The first version of the installation was the result of a collaboration between Lucy Kimbell and sociologist Andrew Barry, shown in 'Making Things Public' at ZKM Karlsruhe, 2005, curated by Bruno Latour and Peter Weibel.